A pre-scheduled forum on the carbon tax's impact in Manitoba suddenly became a topical discussion Wednesday night, hours after the provincial government ditched its own plans for the levy. A scheduled forum on the impact of a carbon tax in Manitoba suddenly became a topical discussion Wednesday night, hours after the provincial government ditched its own plans for the levy. For a number of guest speakers, they had to ditch their notes after the bombshell news from the province. "The announcement today has changed everything. Literally, everything I was going to say is basically gone," said Robert Elms, president of the Manitoba Electric Vehicle Association. What came as no surprise, however, was the absence of Manitoba's environment minister Rochelle Squires, according to Nathan Zahn, who organized the carbon tax forum on behalf of Science First, a group supporting evidence-based policy. Squires cancelled her appearance at the last minute, Zahn told a crowd of dozens at the panel discussion at the Fairmont Hotel in Winnipeg. However, a government spokesperson said Squires had never agreed to attend the forum. "Her staff had previously sent regrets via email to the organizer on the minister's behalf," the spokesperson said in an emailed statement on Thursday morning. "They then followed up with a phone call to again confirm she was unable to attend." 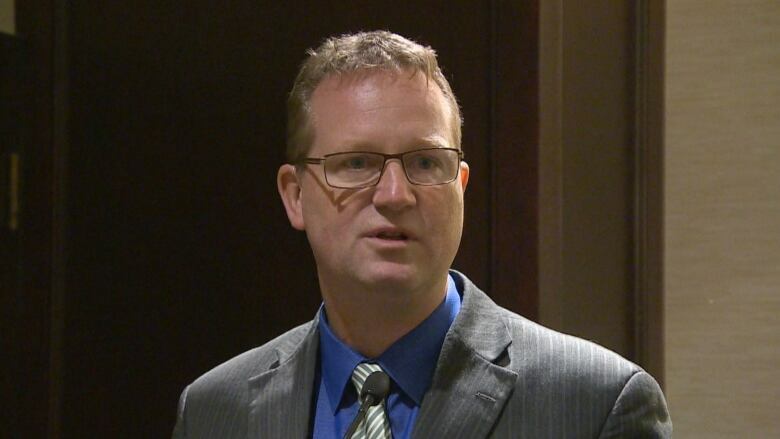 Rob Altemeyer, the NDP's environment critic, said the Manitoba government is joining an anti-science movement that has allies in the ruling parties in Saskatchewan, Ontario and New Brunswick, as well as the united right-wing party in Alberta. "That is why I find what [Pallister] did today is so incredibly irresponsible, so incredibly anti-science and a complete betrayal of his promises to our province." With Manitoba turning its back, Altemeyer said the federal government is within its rights to withhold as much as $67 million, the amount the province was entitled to receive for signing on to the pan-Canadian climate plan. That money was supposed to be set aside for green initiatives, he said. "Brian Pallister has been trying to have it both ways, to claim that he is engaged in the climate change struggle while also resisting just about every initiative that came along," Altemeyer said. "Now it's clear where he actually stands." The federal government must muster the courage to carry through, despite the opposition, Altemeyer said. "They need to impose their carbon tax on every single province, including Manitoba, that is not going to do it themselves." Altemeyer said a "carbon tax is not going to get us the reductions that we need, but it will generate the revenue and the market messaging that we need in order to make real progress." Other speakers saw a way forward for Manitoba's environment. The trucking industry remains committed to supporting an efficiency program that motivates truckers to adopt green technologies, said Manitoba Trucking Association president Terry Shaw. Elms said a couple million dollars would populate Manitoba's roads with enough charge stations to make plug-in vehicles a viable mode of transportation for many. The Manitoba government needs to see reducing emissions as an opportunity, said Nazim Cicek, a professor in biosystems engineering at the University of Manitoba. "We are blessed to be downstream of this water body, to be downwind of the wind belt, to have sun and biomass available to us," Cicek said. He argued consumers should strive to electrify as many of their purchases as they can, like their vehicles and homes. An incentive to change, like a carbon tax, would only help, Cieck said. "If we can electrify those activities, we can decarbonize simultaneously." Claire Coleman, a Charleswood resident in attendance, said after that the province's decision to revoke the carbon tax discourages voices like the forward-thinking panellists she heard from at the forum. "They have solutions that if we applied ourselves, if the government applied itself … would help Manitoba to exist the way it was meant to exist."